I've had some excellent advice from fellow HPC-ers lately and am wondering how best to handle this little problem! For my sins I own a peugeot 206 (54 plate) and I had the misfortune to experience a tyre puncture the other week (late at night etc!). Whilst attempting to change the flattie the damn wheel brace snapped on me! Luckily I 'phoned a neighbour who came to my rescue with a more substantial wheel brace! Now I am just a lowly woman and physically a real weakling so what kind of shoddy crap are peugeot putting in their cars? I have emailed the dealership where the car origninally came from but being peugeot the standard response is always, "outta warranty love". Not even an apology! The service manager has offered to "look at" the duff wheel brace if I take it in, but quite frankly I feel like contacting someone senior within peugeot and (censored!). Any ideas who or where peugeot uk have any senior staff I can bother? The problem is 100% of the British population just drive it slowly to a tyre repair place instead and get it fixed for the £8 they charge, therefore 100% of wheel braces are probably rubbish so you could get a replacement but it would be equally rubbish. Get thee a tubeless tyre repair kit you can repair punctures and reinflate without the need to take the wheel off, on a bike it is a 2 minute job as you can hold the bike up with your shoulder. Rear brakes jammed on, almost caused a fire! Buy a Snap On wheel brace. It will be expensive but these tools are dipped in miracle juice. I second the recommendation for a spider as above. Also, rethink where you take your car for tyres or servicing. I suspect that the last person who put your wheels on rattled the nuts on with an air-gun. This leaves them far too tight for removal with boot tools which are always going to be a compromise involving space, weight and cost considerations as well as their purpose. If a garage can't be bothered to hand-tighten my wheel nuts, then I wonder what else they can't be bothered to do and I avoid going back. Good suggestions, the Snap On wheelbrcae or the spider. When my wife bought her Ka, the first car she has ever owned, I went to check the tyres. It was a right pain to get the spare wheel out so I went and bought one of those aerosol inflation/repair things for her. I havn't used one for years but when I did I found that it did the job well. If you want to talk to someone senior just get the name from a google search and then email using the standard company email address. Works 80% of the time, so use as many names as you can find and you will get a hit eventually. 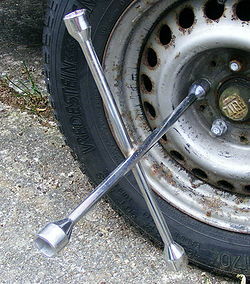 Get yourself a torque wrench. I picked one up at lidl last Christmas for £15. It's about 18" long so has huge amounts of leverage plus you'll be able to tighten the wheelnuts to the correct torque setting. It dealt with my garage overtightened wheelnuts yesterday after a few attempts with the Citroen supplied brace was merely rounding off the nuts everytime I stamped on it. It's not just French cars by any means. I was helping a lady at work change a wheel on her 59 reg Mazda last week. The Mazda supplied wheelbrace wouldn't shift the wheel nuts at all and the jack was so hopeless as to be completely useless. Ironically we had to borrow the jack and wheelbrace from a colleague's Peugeot 207 which worked fine on the Mazda wheel. We will have to agree to differ. I love my Citroen C5 2.2 HDIAll my big Citroens have been great, ranging from a DS to a Citroen CX, to an XM, and now a C5.Wouldn't mind a new shape C5 actually, but leave it a few years. Wouldn't buy a new Cit due to the depreciation! I'll happily add to the "Don't buy French" comments. I also had a 206 once, in and out of the garage all the time, at least under warranty, but that meant clueless Peugeot "mechanics" who were clearly incapable of fixing the problem. They even admitted to me "Well, all we can do is plug it into the computer and see what that says," leaving them no chance if the problem was with the electronics or sensors. Glad to see the back of both the car and the dealers.